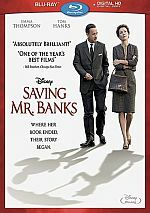 Saving Mr. Banks is a fascinating look at the circuitous "collaborative" process Walt Disney, his creative team, and author P.L. 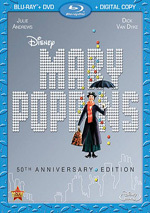 Travers engaged in in bringing the character Mary Poppins to life on the big screen in the early 1960s. With 2013’s Saving Mr. Banks, we take a look behind the scenes of 1964’s classic Mary Poppins. Much of the action takes place in 1961 as we meet Pamela “PL” Travers (Emma Thompson), the author behind Poppins. For years, Walt Disney (Tom Hanks) tried to persuade her to sell the rights so he could adapt the story for the big screen, but Travers resisted. However, due to severe financial issues, Travers finally relents – with strings attached. She wants to be involved in the production to ensure that Disney doesn’t take too many liberties with her property, so we follow her visit to California to view her interactions with Disney as well as the talent involved in the adaptation. In addition to these sequences, we find flashbacks to Travers’ Australian childhood. Known as “Ginty” (Annie Rose Buckley), young Pamela adores her father Travers Goff (Colin Farrell), but he drinks too much and puts the family in persistent financial peril. We trace Pamela’s youth and her time at Disney to see how those two threads intertwine. A film such as Banks runs into potential problems due to its desire to reach a mass audience. Film buffs would love to watch a nuts and bolts re-enactment of the creation of Poppins, but such a project seems unlikely to appeal to a broader crowd. Even though I fall into the group who’d like something devoted to the shooting of Poppins, I have to admit that sounds more like something meant as a Blu-ray bonus than a proper feature. Because of this, it makes sense that Banks digs deeper and delivers more than just an ambitious “making of” program. Does this make Banks a satisfying character drama, though? Maybe. I think it works to a certain degree, but its desire to fulfill the psychological elements as well as the basic “behind the scenes of Poppins” can make it inconsistent. Unsurprisingly, I enjoy the 1961 scenes the best, partly because of Thompson. She delivers a delightful performance, as she brings a tart sensibility to the notoriously prickly author but also manages to dig into the role’s deeper emotions in a seamless manner. Thompson gives us heart without sentimentality. I also find it fun to watch the team put together Poppins. No, we don’t learn much that we don’t already know from that Blu-ray’s bonus materials, but I still think it’s entertaining to see those elements acted out for us. When we go through the creation of Poppins, Banks becomes pretty good. I’m not as wild about the flashbacks, but I understand they’re crucial for the story being told. Was that necessarily the story I wanted to hear? Nope - as I mentioned, I would prefer a movie mostly about the making of Poppins with less psycho-emphasis on Travers and her past. But that was the story they wanted to tell: Travers' history and how it impacted Poppins. This might not be an accurate historical telling, but that's what they chose to convey, and in that framework, the flashbacks seem essential. They make moments that seem inconsequential - like adult Travers' hatred of pears - into something more meaningful and allow us to see how her life influenced her book. What they can’t do is undercut the movie’s relentless sentimentality. Banks flirts with darkness and cynicism but always winds up on the sunny side of the street, a tone not unexpected from a Disney film about a Disney film. That doesn’t make Banks bad, but it does create some disappointment. Whereas one might anticipate that it would accentuate the positive, this does rob the movie of some impact. It becomes hard to take the drama especially seriously when everything gets such a happy-happy veneer. This leaves Banks as an enjoyable but insubstantial experience. While it boasts good performances and can offer a delightful look at the Disney Studios circa the early 1960s, it only sporadically succeeds as a character drama. Saving Mr. Banks appears in an aspect ratio of approximately 2.40:1 on this Blu-ray Disc. The presentation depicted the movie well. Sharpness consistently looked solid. Even in wide shots, the movie came across as well-defined and accurate, without problematic softness along for the ride. No issues with shimmering or jagged edges materialized, and I found no signs of edge haloes. As expected, print flaws never marred the presentation. The film came with a stylized palette that favored a somewhat golden look. Some shots picked up a teal or an orange feel, but those didn’t dominate. I might’ve preferred a more natural tone, but the colors worked fine within the production choices. Blacks came across as tight and deep, and shadows showed nice smoothness. This was a very satisfying image. With its character focus, the DTS-HD MA 5.1 soundtrack of Banks didn’t offer a lot to dazzle. Nonetheless, it created a pretty good feel for its situations. Scenes on the Disney lot or public places created a nice sense for those circumstances, so the track took advantage of its sonic opportunities. There simply weren’t a lot of these that formed an impressive soundscape. Audio quality seemed strong. Music was bubbly and vibrant, while effects demonstrated solid clarity and accuracy; when necessary, the mix boasted fine low-end. Speech remained concise and natural. I thought the mix suited the film. Don’t expect many extras here. Walt Disney Studios: From Poppins to the Present lasts 14 minutes, 35 seconds and includes notes from director John Lee Hancock, production designer Michael Corenblith, matte artist Harrison Ellenshaw, “traffic boy”/artist’s son John O’Connor, animator’s son Ted Thomas, artist’s daughter JP O’Connor, Walt Disney Archives director Rebecca Cline, and songwriter Richard Sherman. The program takes us around modern-day Disney Studios and also provides some memories of the lot in the 1960s. Nothing meaty appears here but we get some decent recollections and footage. Let’s Go Fly a Kite goes for one minute, 47 seconds and takes us to the last day of the film’s shoot. With Richard Sherman on piano, cast and crew sing a version of “Kite”. It’s a cute but insubstantial addition. Three Deleted Scenes fill a total of seven minutes, 24 seconds. We get “Stargaze” (2:22), “Nanny Song” (2:27) and “Pam Leaves” (2:35). “Stargaze” shows a moment of tenderness between Ginty’s parents, and “Song” gives us a song presented to Mrs. Travers. “Leaves” shows an interaction between Walt and Mrs. Travers before she departs California. All three work pretty well and probably got cut for time reasons; I think they likely would’ve fit the movie in a satisfying manner. The disc opens with ads for Mary Poppins and Malificent. Sneak Peeks adds promos for Disney Movie Rewards, Disney Parks and Sleeping Beauty. No trailer for Banks pops up here. With an interesting premise and a quality cast, Saving Mr. Banks delivers occasional pleasure. However, it tends to be an erratic effort that threatens to submerge under the weight of its sentimentality. The Blu-ray provides strong picture and good audio but skimps on bonus materials. Disney fans will enjoy parts of Banks but they shouldn’t expect too much from it.